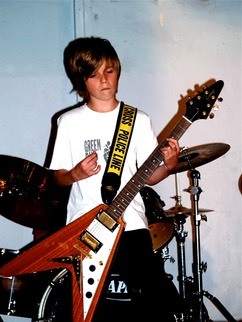 “I highly recommend The Band Project to all Local Mums.�When Matt joined The Band Project he had been playing the electric guitar for about two years and had been having 1 to 1 private lessons. �The Band Project has been a hugely positive experience for Matt, the experience of working as a musician alongside other players has benefited him enormously and his confidence in his playing and has increased immeasurably. His musical and playing ability is recognised by the music department at school, where they have asked him to play at showcase events for them, it is also likely he will achieve his music GCSE this summer and whatever he chooses to do next year, it will involve music!�He has also formed – at least one – band and has the confidence to do regular slots at open mic nights in a local pub. As a mother, one of the things I have been most impressed with (and grateful for) is how working with The Band Project has taught Matt that in music, as in most things, natural talent alone is not enough, that success also requires commitment and dedication in this instance, in terms of being disciplined about practicing and rehearsing. �And, for Matt, this has had a knock- on effect into other areas of his life, he now appreciates that by putting work in to things, even though he does not enjoy them as much as his music, does bring success." We are the UK’s best source for live performance and band-based courses for young and aspiring musicians. We deliver the full band experience – weekly rehearsals, recording studio sessions, guest workshops with top musicians and a final gig in a real venue with a live audience! 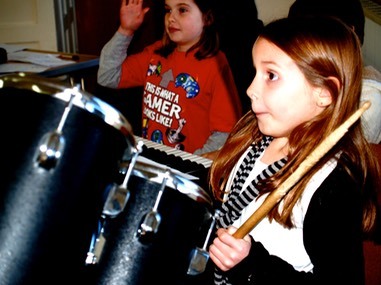 It’s from our love for live music that we’ve created The Band Project, and we’re fully committed to supporting each student every step of the way, so you can become the best performer (and best band!) you can be. The Band Project offers courses for ages 8 – 16 which are the complete band experience for young musicians. Over eleven weeks students receive up to thirty hours tuition in a fully equipped rehearsal room with a trained and DBS, (replacement for the old CRB), checked tutor, four hours in a ￼￼￼￼￼￼￼￼￼￼￼￼￼￼￼￼￼￼recording studio for the older sessions, a workshop with a member of The Band Project All Stars and an end of course gig in a real venue. We are also really excited to be�running free drum workshops at the Brentford Festival on Sunday 7th September!